These unique handmade Christmas ornaments are designed by hand from driftwood collected along the beaches of the beautiful Central Coast of California. 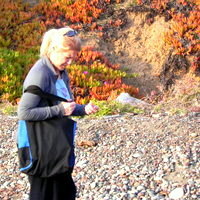 Mary, her husband, and dogs go on regular adventures to the beaches all along the beaches in California, Oregon, and Washington. The beaches are lined with driftwood, shells, stones and other magnificent ocean material. Each trip to the beach yields a new collection of material used to designed these wonderful crosses. Each carved Santa is different, original, and totally unique. You will not find a handmade Christmas ornament like Mary's any place else on the web. Her wood carvings are beautiful and creative. Indeed, these pieces are collector's items. Hand carved Santa ornaments have been Mary's passion for many years. She takes great pride in carving each Santa. If you will notice the header image you will see a few pieces before the carving process is started. It takes a special skill to form a carved santa from a raw piece of driftwood. 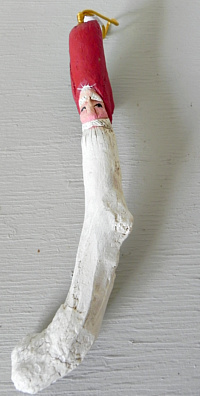 We are certain you will cherish your own personal driftwood Santa from the hands of Mary Elton Wilkerson. A handmade Christmas ornament designed exclusively from driftwood will make a fantastic conversation piece. In addition, the mystery attached to a piece of driftwood makes for great day dreams about where the wood came from and its age. If driftwood could talk what stories it could tell. A driftwood Santa makes a great decoration for any Christmas tree or wall. in any setting. These special handmade Christmas ornaments make a great gift for any occasion. We know you will be proud to own a unique driftwood Santa designed and hand carved by Mary Elton Wilkerson. Each Santa in this gallery has a special page dedicated to its description and price. All you have to do is select the ornament you would like to view in a larger image and click. These special pages also have information about the Santa, prices and ordering information. Take your time viewing Mary's handmade Christmas ornaments and if you have any questions please contact us today.